Daitoku-ji (大徳寺) is a Rinzai Buddhist temple located in Kyoto, Japan. The temple complex has the mountain-name Ryuhozan (龍宝山), literally meaning «dragon treasure mountain.» It was established in 1319 by Shohomyocho (宗峰妙超) who is also called Daitokokushi (大燈国師). Daitokuji was frequented by Emperor Go-Daigo and was counted as one of the five sacred moutains (temples). But after the Ashikaga shogunate was established, it was removed from the list and the shogunate chose to ignore it in favor of other temples that had not openly opposed them. It then decided to stay away from meddling in politics and to focus on Buddhist teachings through Zen practices. During the Onin War, some of its temples were burned down and it was subsequently rebuilt by rich merchants of Sakai. After Ashikaga shogunate fell, many daimyo donated and supported Daitokuji. Many of Daitokuji’s temples were constructed before and early Edo period. 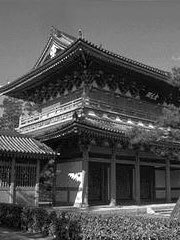 The karamon (唐門) of Daitokuji is believed to be a remnant of Toyotomi Hideyoshi’s richly decorated palace, Jurakudai (聚楽第) and is a national treasure of Japan. The first of three gates was constructed in 1526. The temple has such national treasures as Kannon Enkakuzu (観音猿鶴図) and Daitokokushi Gazo (大燈国師画像). There are also six temples constructed by various daimyo and patrons. Ikkyu and Sen no Rikyu are two of many famous people who had been influenced by Daitoku-ji. A rumor has it that Sen no Rikyu completed two of Daitoku-ji’s three gates in 1589 and this was his undoing. It is said that he chose to have statue of himself on top of the second gate. Hideyoshi Toyotomi who also frequented Daitokuji realized that he and everyone else who pass through the gate to enter will be looked down by the statue. He ordered that the offending statue be removed and ordered ordered Sen no Rikyu to commit seppuku. While it is true that Sen no Rikyu did commit seppuku, the reason for it is not known.